Sulome Anderson is a journalist and author based between Beirut, Lebanon, and Brooklyn, New York. Her award-winning book The Hostage’s Daughter was published by HarperCollins in October 2016. 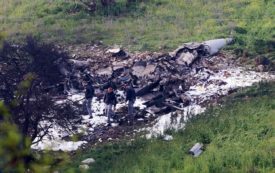 Hezbollah has been steadily consolidating power and weapons—and some fighters maintain it played a role in shooting down an Israeli jet over Syria.